Regardless of socioeconomic status or school district, students (3rd graders) who participate in high-quality music programs score higher on reading and spelling tests (Hille, Katrin, et al. "Associations between music education, intelligence, and spelling ability in elementary school." Adv Cogn Psychol 7, 2011: 1–6. Web. Accessed February 24, 2015). Schools that have music programs have an attendance rate of 93.3% compared to 84.9% in schools without music programs (The National Association for Music Education. "Music Makes the Grade." The National Association for Music Education. Accessed February 24, 2015). Students in all regions with lower-quality instrumental programs scored higher in English and mathematics than students who had no music at all (Journal for Research in Music Education, June 2007; Dr. Christopher Johnson, Jenny Memmott). Students at schools with excellent music programs had higher English test scores across the country thanstudents in schools with low-quality music programs; this was also true when considering mathematics (Journal for Research in Music Education, June 2007; Dr. Christopher Johnson, Jenny Memmott). Students in top-quality instrumental programs scored 17% higher in mathematics than children in schools without a music program, and 33% higher in mathematics than students in a deficient choral program (Journal for Research in Music Education, June 2007; Dr. Christopher Johnson, Jenny Memmott). 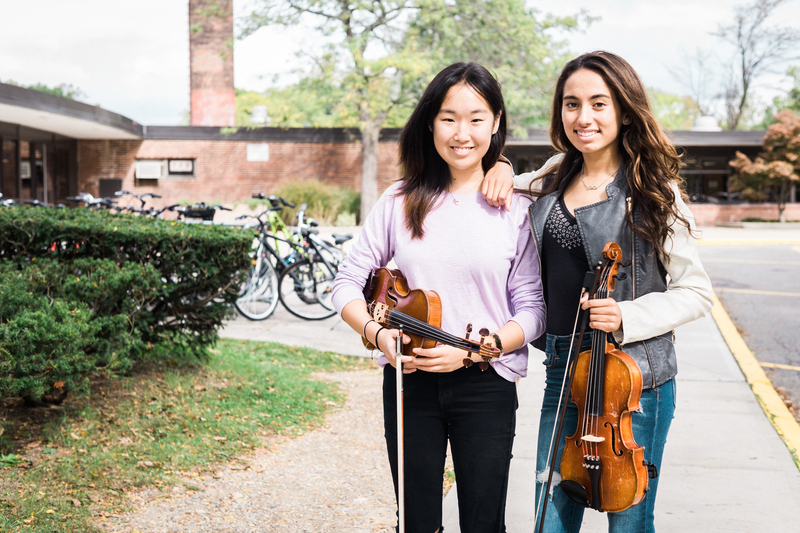 Students in top-quality instrumental programs scored 19% higher in English than students in schools without a music program, and 32% higher in English than students in a deficient choral program (Journal for Research in Music Education, June 2007; Dr. Christopher Johnson, Jenny Memmott). 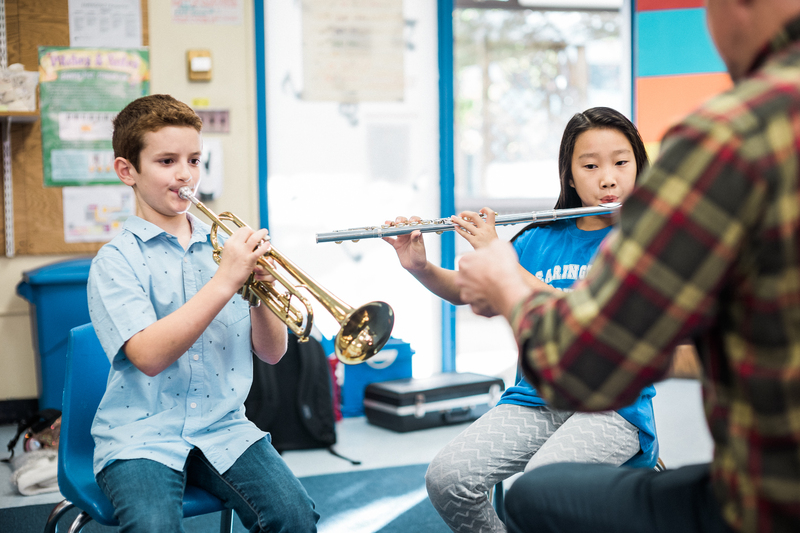 Substantial majorities of both teachers and parents view student access to music and arts education as “extremely” or “very” important (NAMM Foundation and Grunwald Associates LLC, 2015. Striking a Chord: The Public’s Hopes and Beliefs for K–12 Music Education in the United States: 2015). On average, students have had only about three years of in-school music education, according to parents; more than a third have had one year or less, with one in six of all students having had no music instruction at all (NAMM Foundation and Grunwald Associates LLC, 2015. Striking a Chord: The Public’s Hopes and Beliefs for K–12 Music Education in the United States: 2015). Substantial majorities of both parents and teachers want to see the scope of elementary school music education expanded (NAMM Foundation and Grunwald Associates LLC, 2015. Striking a Chord: The Public’s Hopes and Beliefs for K–12 Music Education in the United States: 2015). Substantial majorities of teachers and parents believe budget cuts in music programs hurt students and that music is not as adequately funded as other core subjects. Most teachers and parents rate the funding for their own school’s music program as average or worse (NAMM Foundation and Grunwald Associates LLC, 2015. Striking a Chord: The Public’s Hopes and Beliefs for K–12 Music Education in the United States: 2015). Asked about 15 possible ways to cut school budgets, both teachers and parents are more willing to make cuts in 12 of the 14 other curricular, administrative and service areas than cut music and arts education. Only the number and salaries of teachers are more sacrosanct (NAMM Foundation and Grunwald Associates LLC, 2015. Striking a Chord: The Public’s Hopes and Beliefs for K–12 Music Education in the United States: 2015). More than 80 percent of teachers, and nearly as many parents, say that the time allotted to music education—adequate rehearsal time, class duration and class frequency— is important for a quality music education program (NAMM Foundation and Grunwald Associates LLC, 2015. Striking a Chord: The Public’s Hopes and Beliefs for K–12 Music Education in the United States: 2015). Eight in 10 teachers and more than seven in 10 parents believe the number of minutes of music education required every week is an important quality component (NAMM Foundation and Grunwald Associates LLC, 2015. Striking a Chord: The Public’s Hopes and Beliefs for K–12 Music Education in the United States: 2015). The number and quality of musical instruments, along with materials, are high on parents’ lists of “must haves” for a quality program. But many teachers report that these essentials are in short supply (NAMM Foundation and Grunwald Associates LLC, 2015. Striking a Chord: The Public’s Hopes and Beliefs for K–12 Music Education in the United States: 2015). Fewer than half of teachers (42 percent) and parents (46 percent) say their schools have the musical instruments they need for all students who want to learn to play (NAMM Foundation and Grunwald Associates LLC, 2015. Striking a Chord: The Public’s Hopes and Beliefs for K–12 Music Education in the United States: 2015). 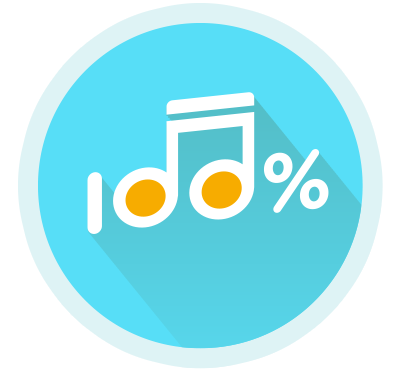 Just 41 percent of teachers and 46 percent of parents say their schools have enough sheet music for every participating child (NAMM Foundation and Grunwald Associates LLC, 2015. Striking a Chord: The Public’s Hopes and Beliefs for K–12 Music Education in the United States: 2015). Teachers in urban schools are more likely to consider music and arts education as core to the curriculum (38 percent) and value access to it (81 percent), compared to teachers in rural areas (30 percent of whom consider music and arts education as core to the curriculum and 70 percent of whom value access to it) (NAMM Foundation and Grunwald Associates LLC, 2015. Striking a Chord: The Public’s Hopes and Beliefs for K–12 Music Education in the United States: 2015). Urban teachers also believe more strongly that music education can build 21st century skills, such as communication, critical thinking, problem-solving and innovation skills (NAMM Foundation and Grunwald Associates LLC, 2015. Striking a Chord: The Public’s Hopes and Beliefs for K–12 Music Education in the United States: 2015). African-American parents (76 percent) and Hispanic parents (75 percent) are significantly more likely than Caucasian parents (67 percent) to enroll their children in school music classes where opportunities exist, and they are more interested in their children participating in virtually every type of music class in or out of school (NAMM Foundation and Grunwald Associates LLC, 2015. Striking a Chord: The Public’s Hopes and Beliefs for K–12 Music Education in the United States: 2015). 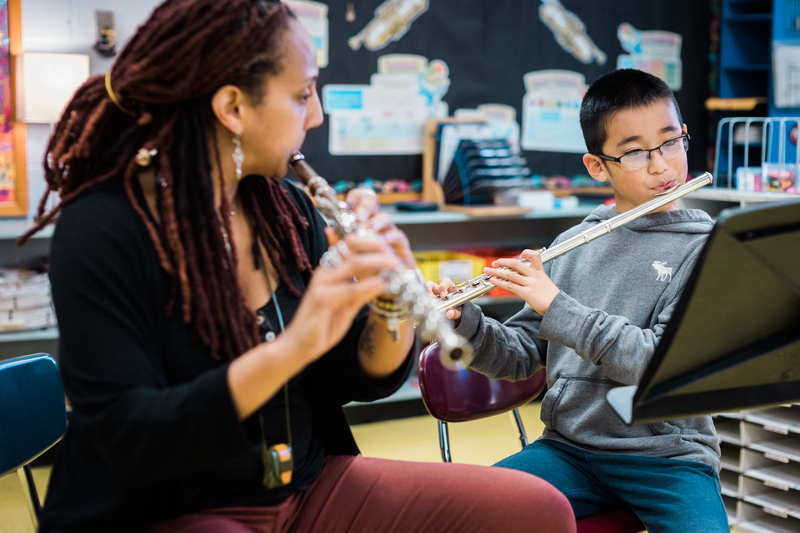 African-American and Hispanic parents generally believe more strongly in a wide array of potential benefits from music education, are more likely to have seen these positive impacts on their own child and more strongly support expanding music education programs. Ironically, these parents also are more likely to report that there are no music programs in their schools (21 percent of African-American parents and 22 percent of Hispanic parents report this, compared to 15 percent of Caucasian parents)(NAMM Foundation and Grunwald Associates LLC, 2015. Striking a Chord: The Public’s Hopes and Beliefs for K–12 Music Education in the United States: 2015). Students in the West are more likely to have school music programs that take place only outside of school hours—and they have access to fewer types of programs as well (NAMM Foundation and Grunwald Associates LLC, 2015. Striking a Chord: The Public’s Hopes and Beliefs for K–12 Music Education in the United States: 2015). More than eight in 10 teachers (83 percent) and more than seven in 10 parents (73 percent) say budget cuts in music education are detrimental to students (NAMM Foundation and Grunwald Associates LLC, 2015. Striking a Chord: The Public’s Hopes and Beliefs for K–12 Music Education in the United States: 2015). On average, both teachers and parents would be more willing to cut spending in 12 of 15 other programs before they’d cut funding for music and arts education (NAMM Foundation and Grunwald Associates LLC, 2015. Striking a Chord: The Public’s Hopes and Beliefs for K–12 Music Education in the United States: 2015). Teachers in Title I schools are more likely to report that their schools have no music program at all. In Title I schools that do offer music programs, teacher responses suggest that they have fewer full-time music teachers— and teachers in these schools are more likely to report there are no professional development opportunities for the music teachers they do have (NAMM Foundation and Grunwald Associates LLC, 2015. Striking a Chord: The Public’s Hopes and Beliefs for K–12 Music Education in the United States: 2015). Federal education policy specifically authorizes the use Title I funds for music and arts education. But few teachers— even the majority who know what Title I is—are aware of this significant opportunity to provide or improve music programs in the country. Even fewer parents are familiar with Title I, let alone the fact that Title I funds can be used for music education (NAMM Foundation and Grunwald Associates LLC, 2015. Striking a Chord: The Public’s Hopes and Beliefs for K–12 Music Education in the United States: 2015). The College Board identifies the arts as one of the six basic academic subject areas students should study in order to succeed in college (Academic Preparation for College: What Students Need to Know and Be Able to Do, 1983 [still in use], The College Board, New York). Nine in ten adults believe students benefit from having music included in their curriculum (89 percent) ("Public Schools are Improving Their Grades, but Private Schools Remain at the Head of the Class," Harris Poll, September 29, 2015). Research at McGill University in Montreal, Canada showed that grade-school kids who took music lessons scored higher on tests of general and spatial cognitive development, the abilities that form the basis for performance in math and engineering (http://nisom.com/index.php/instruction/health-benefits). A 2012 U.S. Department of Education report that compared surveys from 1999-2000 and 2009-2010 found that music was offered in 94 percent of elementary schools during both timeframes, and that visual art offerings dropped only slightly, from 87 percent of schools in 2000 to 82 in 2010 (Jessica Siegel, "Amid Tests and Tight Budgets, Schools Find Room for Arts," CityLimits.Org, June 7, 2013). Learning a musical language could have cognitive benefits similar to those evident in bilingual children. Although this view has intuitive appeal because music and language are both auditory communication systems, the positive effects of bilingualism are evident for fluid intelligence (i.e., executive control) but not for crystallized intelligence (e.g., knowledge acquired through experience, such as vocabulary), whereas the effects of music lessons appear to extend to both domains (E. Glenn Schellenberg, "Music and Cognitive Abilities," Current Directions in Psychological Science Journal, Vol. 14, No. 6, December 2005). Music training in childhood “fundamentally alters the nervous system such that neural changes persist in adulthood after auditory training has ceased" (Skoe, E. & N. Kraus. 2012. A little goes a long way: How the Adult Brain Is Shaped by Musical Training in Childhood. The Journal of Neuroscience, 32(34):11507–11510). Studies have shown that young children who take keyboard lessons have greater abstract reasoning abilities than their peers, and that these abilities improve over time with sustained training in music (Rauscher, F.H. , & Zupan, M., "Classroom keyboard instruction improves kindergarten children's spatial-temporal performance: A field experiment" Early Childhood Research Quarterly, 15 , 215-228.2000). Children with learning disabilities or dyslexia who tend to lose focus with more noise could benefit greatly from music lessons (Arete Music Academy. "Statistical benefits of music in education." Arete Music Academy. Accessed July 17, 2014). Young children who take music lessons show different brain development and improved memory over the course of a year, compared to children who do not receive musical training (National Association for Music Education. "The Benefits of the Study of Music." National Association for Music Education. Accessed July 17, 2014). Young Children who take music lessons show different brain development and improved memory over the course of a year, compared to children who do not receive musical training (Dr. Laurel Trainor, Prof. of Psychology, Neuroscience, and Behavior at McMaster University, 2006). Musically trained children performed better in a memory test that is correlated with general intelligence skills such as literacy, verbal memory, visiospatial processing, mathematics, and IQ (Dr. Laurel Trainor, Prof. of Psychology, Neuroscience, and Behavior at McMaster University, 2006). Music education sharpens student attentiveness (Arts Education Partnership, 2011). Music education equips students to be creative (Arts Education Partnership, 2011). According to research published in a 2014 article in Parents magazine, learning how to play percussion instruments helps children develop coordination and motor skills, because they require movement of the hands, arms, and feet (Kwan, A. 2013, “6 Benefits of Music Lessons,” Parents). In order to fully reap the cognitive benefits of a music class, kids can’t just sit there and let the sound of music wash over them. 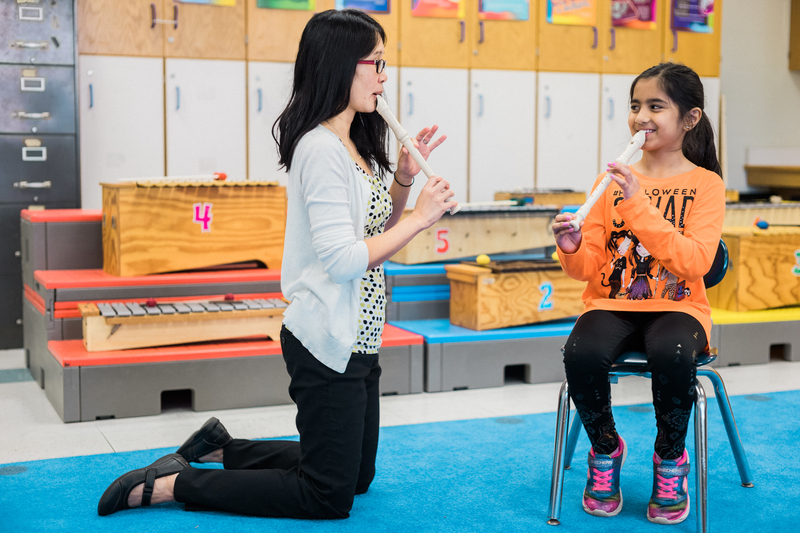 They have to be actively engaged in the music and participate in the class (Dr. Nina Kraus, director of Northwestern’s Auditory Neuroscience Laboratory). A study at the University of California at Irvine demonstrated that young kids who participated in music instruction showed dramatic enhancements in abstract reasoning skills. In fact, researchers have found neural firing patterns that suggest that music may hold the key to higher brain function (Rauscher, Shaw, Levine , Ky and Wright, "Music and Spatial Task Performance: A Causal Relationship," University of California , Irvine , 1994). Playing a musical instrument strengthens eye-hand coordination and fine motor skills, and kids who study an instrument learn a lot about discipline, dedication and the rewards of hard work (http://nisom.com/index.php/instruction/health-benefits). Music training leads to greater gains in auditory and motor function when begun in young childhood; by adolescence, the plasticity that characterizes childhood has begun to decline. Nevertheless, our results establish that music training impacts the auditory system even when it is begun in adolescence, suggesting that a modest amount of training begun later in life can affect neural function (Adam T. Tierney, Jennifer Krizman, Nina Kraus, "Music training alters the course of adolescent auditory development," Proceedings of the National Academy of Sciences, 2015). In a 2009 study in the Journal of Neuroscience, researchers used an MRI to study the brains of 31 6-year-old children, before and after they took lessons on musical instrument for 15 months. They found that the music students’ brains grew larger in the areas that control fine motor skills and hearing—and that students’ abilities in both those areas also improved. The corpus callosum, which connects the left and right sides of the brain, grew as well (Joanne Lipman, "A Musical Fix for American Schools," The Wall Street Journal, October 10, 2014). Exposing children to music during early development helps them learn the sounds and meanings of words. Dancing to music helps children build motor skills while allowing them to practice self-expression. For children and adults, music helps strengthen memory skills (© 2015 Program for Early Parent Support (PEPS), a 501(C)(3) nonprofit organization). Children who study a musical instrument are more likely to excel in all of their studies, work better in teams, have enhanced critical thinking skills, stay in school, and pursue further education (Arte Music Academy. "Statistical benefits of music in education." Statistical-Benefits-Of-Music-In-Education. Accessed July 17, 2014). Hispanic and African-American parents generally feel music provides more benefits to children than other parents do. Like their urban counterparts, however, they feel they’re being shortchanged in a number of ways—though they’re taking steps to overcome these deficits that could model solutions for other groups (NAMM Foundation and Grunwald Associates LLC, 2015. Striking a Chord: The Public’s Hopes and Beliefs for K–12 Music Education in the United States: 2015). Majorities of both parents and teachers see a myriad of social-emotional, academic, 21st century skill, community, and physical and health benefits from music education—especially social-emotional benefits (NAMM Foundation and Grunwald Associates LLC, 2015. Striking a Chord: The Public’s Hopes and Beliefs for K–12 Music Education in the United States: 2015). Majorities of both parents and teachers are aware of research on the effects of music on the developing brain, and have personally experienced the benefits of music education on their own children or students (NAMM Foundation and Grunwald Associates LLC, 2015. Striking a Chord: The Public’s Hopes and Beliefs for K–12 Music Education in the United States: 2015). Majorities of parents whose children are involved in music classes also credit music education for making them happier, more focused, more selfdisciplined, stronger academically and more helpful (NAMM Foundation and Grunwald Associates LLC, 2015. Striking a Chord: The Public’s Hopes and Beliefs for K–12 Music Education in the United States: 2015). Taking music lessons offers a space where kids learn how to accept and give constructive criticism, according to research published in The Wall Street Journal in 2014 (Joanne Lipman, "A Musical Fix for American Schools," The Wall Street Journal, October 10, 2014). Group classes require peer interaction and communication, which encourage teamwork, as children must collaborate to create a crescendo or an accelerando (Kristen Regester, Early Childhood Program Manager at Sherwood Community Music School at Columbia College Chicago. Copyright © 2013 Meredith Corporation). Playing an instrument teaches kids to persevere through hours, months, and sometimes years of practice before they reach specific goals, such as performing with a band or memorizing a solo piece (Mary Larew, Suzuki violin teacher at the Neighborhood Music School in New Haven, Connecticut. Copyright © 2013 Meredith Corporation). Kids who make music have been shown to get along better with classmates and have fewer discipline problems. More of them get into their preferred colleges, too (http://nisom.com/index.php/instruction/health-benefits). 95 percent of Americans consider music to be part of a well-rounded education, and 93 percent feel that schools should offer music education as part of the regular curriculum. Nearly four in five (79 percent) even say that music education should be mandated for every student in school (2003 Gallup Poll conducted for NAMM). Research tells us children who play music do better in school and in life.